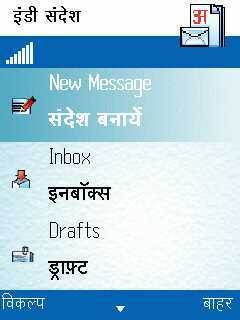 IndiSMS is free mobile software for formatting, sending and reading SMS in local Indian languages. IndiSMS is available for Symbian (Nokia)and Java (SonyEricsson and other) supported mobile phones. 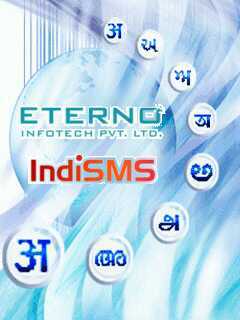 The latest version of IndiSMS, IndiSMS 2 can send SMS in 9 Indian languages, including Hindi, Marathi, Punjabi, Gujarati, Bengali, Telugu, Kannada, Malayalam and Tamil. Download it right away to send SMS in Indian languages. IndiSMS can send SMS in all-above mentioned Indian languages, but the target devices should support IndiSMS installed or should have necessary fonts to read the incoming SMS messages. India SMS uses two types of input methods to format SMS in Indian languages. One based on typed English language and other is a virtual language keypad. When we type SMS in English, it is automatically converted to the selected Indian languages. You can select the required SMS language on loading the application. After that you can read an incoming SMS or create a new message. All incoming messages from IndiSMS can be accessed and read from IndiSMS Inbox itself. boss does we need registry key for that???? No Registration KEY is Required, Software is Freeware and you can register after installing software in your mobile by selecting Register option available in IndiSMS. I had sent ACTV Code request 2 times and i didn’t get it! Please send it to my e-mail id soon……………………………. i need actv coad pls send me soon …… my imei No. 351863015027234 i am waiting……. did not got ACTV Code. pls send it quickly.